We believe “It is better to build children than to repair men.” To that end we strive to provide quality literature and educational books for use in training the next generation. We trust our products will assist you in developing your family’s love for God and country. I received the Frederic Chopin study set to review. 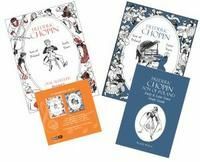 It includes two books: Frederic Chopin Early Years and Frederic Chopin Later Years, a study guide, and a CD. Both books were written by Opal Wheeler and were first published in the late 1940’s. The study guide contains reading comprehension questions, character qualities, and tidbits of interest for each chapter. The CD has mp3 files of music in the order it was mentioned in the books, as well as sheet music and coloring pages. The coloring pages are the same as the black and white illustrations from the books. When I first saw the books, the larger print made me think the books were for younger children. However, as I began reading them I realized that the books were interesting, well-written and suitable for all ages. The author brings the story to life with descriptive passages and dialogue. The study guide is short, but I found the Tidbits of Interest sections very helpful in providing additional information. I knew very little about Poland and the extra information helps to better put the books in their proper historical context. The accompanying cd completes the composer study. I especially like how the book coordinates with the music, having the printed music in the text and listening to it too. The sheet music is also a fun feature for children (and adults) who play the piano. Hi, Kristen, I have awarded you the Beautiful Blogger award. I have enjoyed reading about your family and I am inspired by your thoughtful posts.